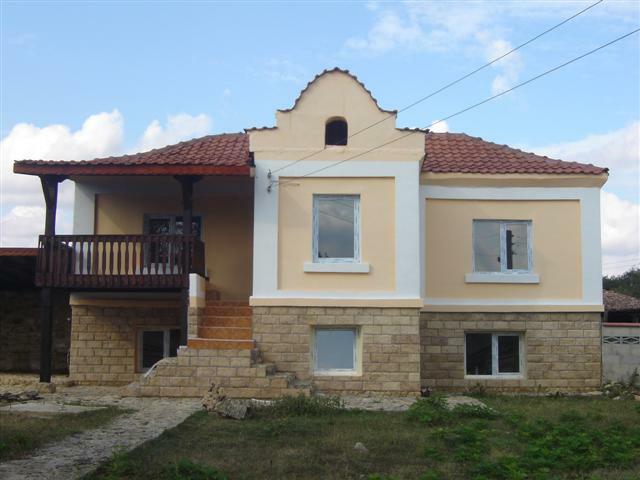 Description: Splendid two-storey house set in a village � 50min. drive from Varna. The village is accessible all year round, and benefits from all facilities that the closeness to a big city can provide. The village itself is located in a beautiful rural area with a very good road connections. There is convenient bus transport to Dobrich town and Valchi dol. The village is situated near the city of Valchi dol, where is a well maintained system of medical services, banks and public utilities. It has good access, road network and the communications with all parts of the country. In front of the house is located huge green area. It is entirely renovated house that is good either for holiday rest and permanent living. The house offers kitchen, folk room with fireplace and living room on the 1st floor and 2 bedrooms, fitted bathroom and balcony on the 2nd floor. Summer kitchen with BBQ area, a well and 3 parking lots are available in the yard of the house. The yard is large and enough to have swimming pool. The property is set on a plot of 3000 sq/m, which can be divided into two separate parts. This may give the opportunity for building another neighboring house or bungalow. A beautiful fence surrounds the house and the plot keeping your privacy. The property has been recently refurbished and it s in very good condition. The house has a new roof. This is a wonderful village property, suitable for a holiday home or for a full-time residence. This charming country house could be your home, just find your place here !